Our Camino del Norte Walk and Coach tour is ideal for Camino beginners, a perfect introduction to the uniqueness of the Way of St James. You will enjoy all the comforts of our coach tours while experiencing the atmosphere, scenery and history of the Camino del Norte. Each day includes an easy 1 and a half to 2-hour walk in some of the most scenic regions on the Camino del Norte and nearby such as the Picos de Europa National Park and the Cathedrals Beach. On this Camino guided tour we will wander on and off the Camino del Norte and visit must-see places on the route but also in areas nearby, experiencing the best of both worlds: walking and sightseeing. The Camino Walk and Coach tour runs over 8 days/7 nights with dinner each night and lunch on your activity days. All our guided tours include English-speaking guides. Today you will arrive in Bilbao. The group will be meeting the tour guide at the hotel at 7pm and enjoy dinner together around 8pm. Let us know if you require a later check-in time. 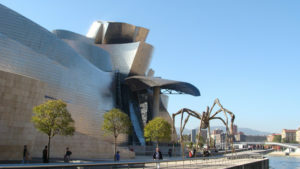 Today the group will visit Bilbao in the morning, including its most iconic building: the Guggenheim Museum. The group will then enjoy lunch together in Bilbao. After lunch, you will have free time so you can explore this fascinating city at your own pace. The group will meet again later that evening to go for dinner. Today the group will travel to La Arena beach to enjoy a 7km walk along the coast. Walking along coastal paths, the group will be rewarded by the stunning views of the coastline. The walk will finish in the town of Onton, where we have organised lunch for the group. After lunch you will be transferred to Santander, where you will have free time to relax or explore this pretty coastal city. There is plenty to do in Santander: The fishing harbour is a great place to try some of the local seafood and the Magdalena Palace is a must see. This impressive building is the seasonal residence of the Spanish royal family. 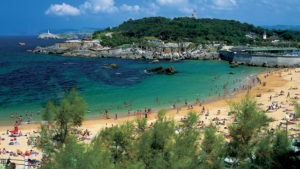 Santander is also home to a whole host of beautiful beaches. In the evening, the group will meet again for dinner. Today you will travel to the Picos de Europa National Park, approximately 20km inland from the Camino del Norte route. We have planned a stunning mountain range loop walk for the morning. The Picos de Europa is a national park and protected area of great natural beauty. The group will enjoy truly breathtaking scenery. After your walk, the group will travel to the nearby town of Ribadasella, where we will have lunch by the sea. After lunch, the group will travel to the coastal city of Gijon, where you can enjoy some free time to explore or relax. Go for a stroll along the seafront, relax at the beach, visit its museums or just explore its town centre and admire the local architecture. We will then meet in the evening for dinner. Today you will be transferred in the morning to Salinas, where you will begin your walk. The trail follows the coast for 10kms and after the walk, the group will enjoy lunch at the picturesque Cudillero harbour. After lunch, you will then be transferred to the historic town of Ribadeo. You will enjoy some free time to relax or explore Ribadeo Old Town before the group meets again to go for dinner. Admire the impressive architecture of the Indianos houses with their colonial style, stroll by the harbour and take in the views of Ribadeo Bay. 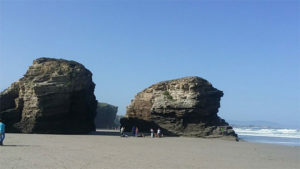 This morning, the group will be walking 8km of the magnificent Cantabrian Coastal Way trail out of Ribadeo and along the coastline to reach the famous Cathedrals Beach, with its iconic cliffs and stunning setting. After this coastal walk, the group will then enjoy lunch at a restaurant nearby. 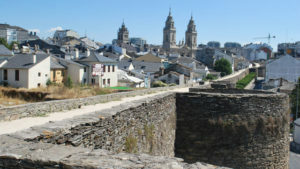 After lunch, the group will travel to Lugo. The city is well known for its Roman heritage, particularly for its UNESCO listed Roman wall, wrapped around the old town. The walls reach a height of almost 15 metres, they are still in excellent condition, and remain completely intact. The guide will take the group for a walk on the wall, where you can enjoy unique views of the city. After the walk, you can enjoy some free time before meeting the group again for dinner. On your last day, the group will walk the last stretch of the Camino into the city of Santiago. It is just 5 kms from Monte do Gozo, where you will catch your first glimpse of Santiago de Compostela. 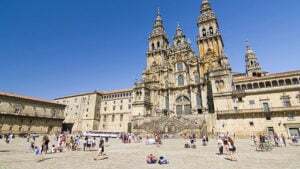 The group should be reaching the famous Praza do Obradoiro and Santiago Cathedral in time to make the pilgrim mass at 12pm*. After lunch you will have free time to explore this fantastic historic city. 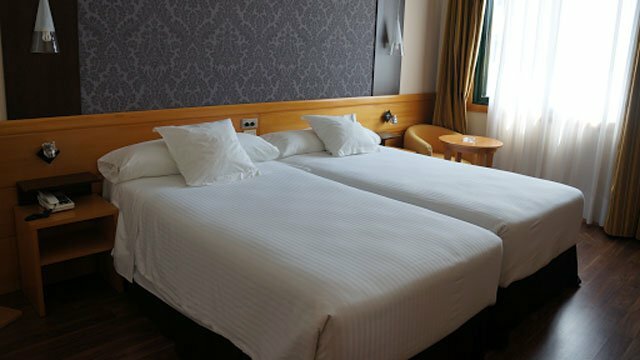 Tonight you will be staying in a 4-star hotel in Santiago city centre. Santander Airport 100km: For the transport from/ to the airport, the easiest way is to choose the direct bus line (starting point: Termibus) from/ to the airport (6 times/ day, approx. 1h30). 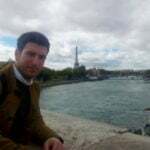 See www.movelia.es. Your booking also includes: Holiday pack and maps, all rooms with private bathrooms, knowledgeable friendly English speaking guide, 24/7 support during your trip as well as GPS data files. Breakfast, Lunch and dinner are included each day (No lunch on your final day in Santiago de Compostela).